Cattle suffer damage from wolves far beyond predation | RANGEfire! This is a significant impact, but ranchers who have been dealing with wolves have reported additional costs and losses when wolves are present. These costs include weight loss, lower pregnancy rates, reduced gain for calves, more sickness, and an increase in management costs. Most discussions about the impact of wolves on livestock producers focus on depredation losses, both confirmed and unconfirmed. The rule of thumb is that for every confirmed kill there are probably eight more unconfirmed losses. David Bohnert, beef extension specialist and ruminant nutritionist at Oregon State University (Eastern Oregon Agricultural Research Center, at Burns, OR) and coworkers decided to do studies looking at these issues. After wolf introduction into Wyoming and Idaho, and expanding wolf population into Washington and Oregon, there was a growing perception and anecdotal reports by beef producers that the damages they were seeing went far beyond actual death losses. “The Oregon Beef Council helped fund some research that Renaldo Cooke and I proposed. John Williams, Wallowa County Extension agent (now retired) was part of this work as well. Our first study used cattle from Idaho that had been exposed to wolves for several years, with numerous verified cases of wolf depredation. In contrast, cattle here at our Research Station at Burns, OR, had never experienced wolves, so we decided to compare the two groups of cattle,” he told WLJ. 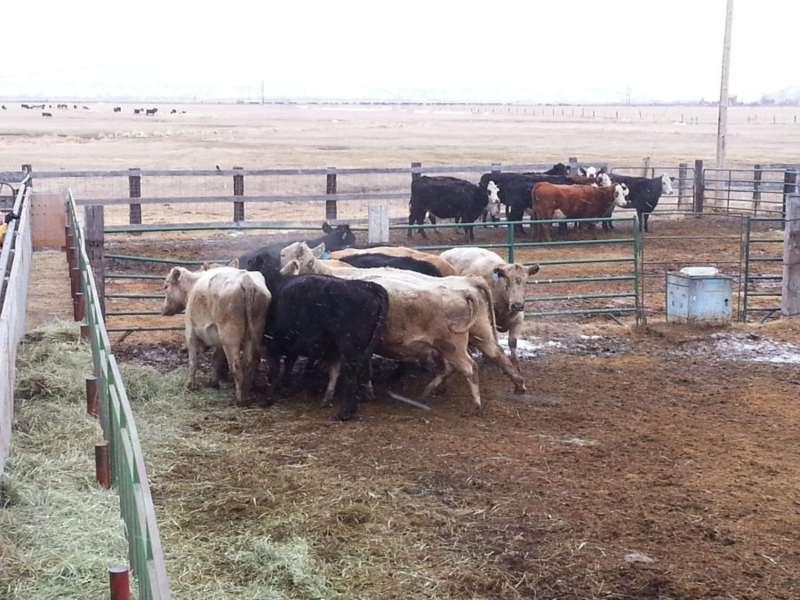 “We brought in 50 cows from the Idaho operation and used 50 of our cows, running them together as a common herd. We managed them all the same and ran them through our working facility weekly for two months so they would get used to it. This gave the Idaho cows time to settle in and become comfortable here. We wanted to look at stress effects, so we gave them time to become familiar with our facilities, handling, and people—to remove that potential source of stress,” he explains. Initially, the cattle were sorted by temperament (flighty or not) and their identity blocked so the data could be analyzed scientifically and statistically. “We had five groups of 10 cows from each herd. We thus had five groups from the wolf-exposed cows and five groups of the non-wolf-exposed cows. This allowed us to compare two groups (one group from each herd) at a time, to evaluate differences in stress and behavioral responses,” he says. At that point, the preliminary data was collected, looking at temperament, body temperature, and the levels of cortisol (a stress hormone) in the blood. 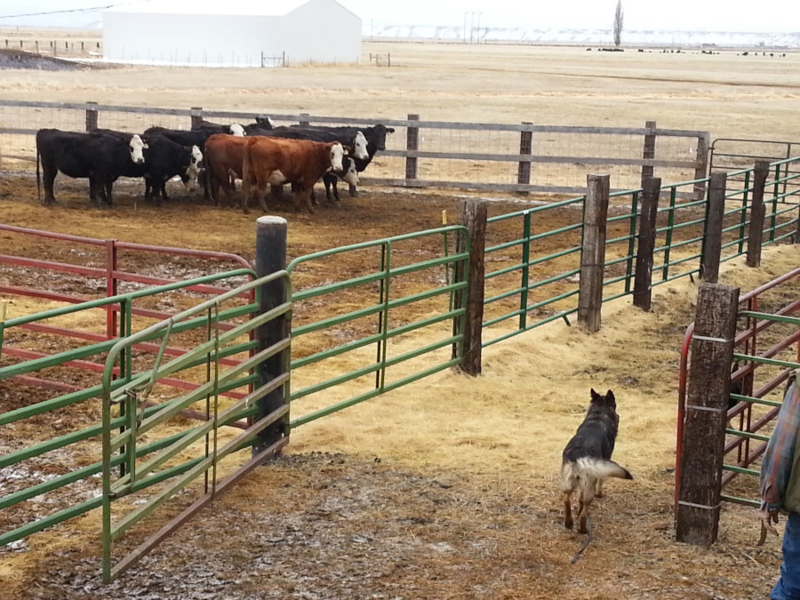 The dogs were walked past the corral, to create the presence of a large canine. In short, the cattle with wolf experience became visibly stressed and agitated. A series of photos documenting the initial Oregon State University wolf experiment. Cattle that had never experienced a wolf attack were curious about the experiment’s “mock wolves” while experienced cattle showed dramatic fear and defensive behavior, as well as dramatically higher levels of stress hormone in their blood. By comparison to the wolf-naive cattle (pictured top right), the cattle that had experienced a wolf attack (foreground) bunch up tightly and struggle to get into the center of the small herd when exposed to the mock wolves in the study. This is a clear and dramatic fear response in cattle. I would imagine humans stress out too. While they walk thru wolf ridden wilderness unarmed. It’s rather obvious all that’s going to be left is possibly a stocking cap. Soo cattle are likely smarter than a lot of wolf hugger humans. I’ll guarantee you that wolves can smell lead….they know if your armed or not. Run a study on that. The rancher and sportsman take in the neck. Fish and game manage money not game. It’s a money game. If I were indeed in wolf territory, yes I would stress knowing what could happen, but I have no business there, if they did I would take the precautions stated by rangers, biologist,they are wild animals and deserve respect on their turf. The issues don’t stop here. ID, WY and MT have been experiencing wolf issues for over 20 years now. If ranchers want to utilize non’lethal tactics they need to have a couple breeding facilities for guard dogs. Wolves will kill those dogs a lot of those dogs quickly. Once again, wolf activists, ignore the impacts on other wildlife in favor of their favorite. Deer and elk are constantly evolving in their evasion tactics. In Idaho deer and elk herds are staying much lower and longer in farmer fields and rancher home pastures. This is causing damage here too, to fences, irrigation equipment and crops. As deer, elk leave the backcountry for safety lower down, wolves and grizzlies kill more cattle for food, which requires more removal by paid USFWS personnel, which is very expensive. Once, again wolves have and are proving why they were removed in the first place. I have never understood what our Government or any group had hoped to accomplish that would have significant or even visible or invisible as an accomplishment to nature or human? The only accomplishment I can see is an environmentalist extremist stroking their ego and being in a position to say look what I (we) accomplished. I have followed articles read what I could and even listened when possible. Could someone please help me? What is the purpose? Interesting research. Something a lot of us always knew.